Back in April we told you all about a driver in the CalArk family who had hit his Million Mile Milestone with us. 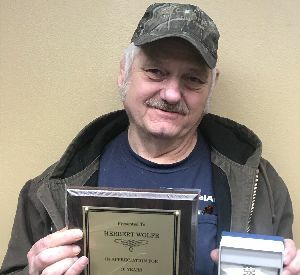 Herbert Wolfe came back in today to pick up his 10 year service award, which included a plaque and a two-tone Seiko watch with the CalArk logo on it. Herbert plans on retiring this coming April after nearly 30 years in the trucking industry. When asked what he plans to do upon retirement, Herbert says he is going to find a girlfriend. If you know him at all, you know he is always joking. We will miss his joyful demeanor and his distinguishable laugh in the hallways once he retires, but we wish him all the very best! Thank you, Herbert, for spending the last 10 years moving the Wheels of American Business.